The Palafox House, located at 196 North Palafox, where Palafox and Gregory streets meet, is the newest addition to Great Southern Restaurants. Housed in a historic 1912 building in the heart of downtown Pensacola, The Palafox House is a wonderful example of early 20th century architecture. The Palafox House is available as a rental venue for all types of events; rehearsal dinners, corporate gatherings, bridal luncheons – the list is endless. 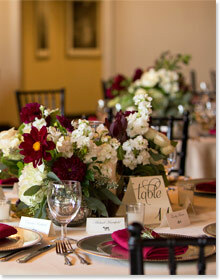 The Palafox House can accommodate groups of 100 plus for a sit-down affair and 200 plus for a cocktail-style event. The Palafox House has large windows comprising an entire wall of the venue, allowing for a wonderful view of downtown Pensacola’s tree-lined streets. High ceilings, chandeliers, original brick walls all add to the ambiance of the venue. In addition to the main event space, there is also a smaller space adjacent that houses a kitchen, built-in bar and reception area.